Earlier in this blog we discussed German Station, the site of the first free settlement at Moreton Bay. The mission was inaugurated by a group of German clergy who came here in 1838. Later, the area around the station became known as Toombul shire and then Nundah. In a somewhat confusing situation, Nundah is now a suburb and Toombul is what is known as a "residential locality", meaning that it does not have full suburban status, but for historical reasons the name remains in use. Toombul shire came into being around 1883, and in 1891 the municipal offices for the shire were built, to a design by the firm of John Hall and Son who had designed the South Brisbane Town Hall. The following photograph was taken in 1993. The Toombul Shire Council ceased to be upon the formation of the Greater Brisbane Municipal Council in 1925, and that body took over the custody of the former shire offices. 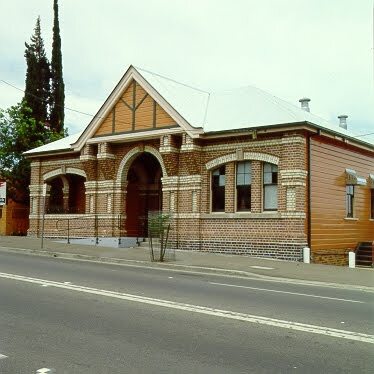 The Brisbane City Council undertook heritage renovations in 1987, and the building is still a community hall to this day. Here is my recent picture of it. The busy Sandgate Road traffic which once passed by the front door has been diverted by a tunnel, and so the old building is quite accessible now. The building to its left, which houses an accounting office, has been built in a similar style, giving the area a nostalgic look.